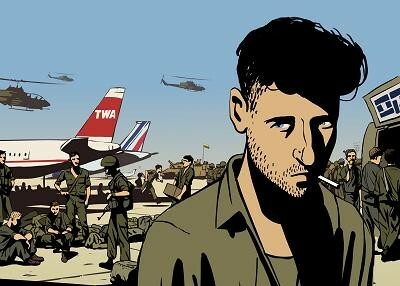 “Waltz With Bashir” is an animated film directed by Ari Folman, Folman was a 19 year Israeli soldier in 1982 and witnessed the massacres in Sabra and Shatila. The film follows Folman as he re investigates his time at these events, a task he under took as a form of self therapy as he realised later in life that he had blocked out many of the memories and experiences from this time. What unique about the feature is that it was film begun as a straight documentary but then brought to life by animators and art directors, Yonni Goodman and David Polonsky. Transforming the feature by adding surrealism and comic style imagery to sensitive nature of the subject matter. The film was nominated for the “Palme d’Or” the top prize at Cannes film festival earlier this year.